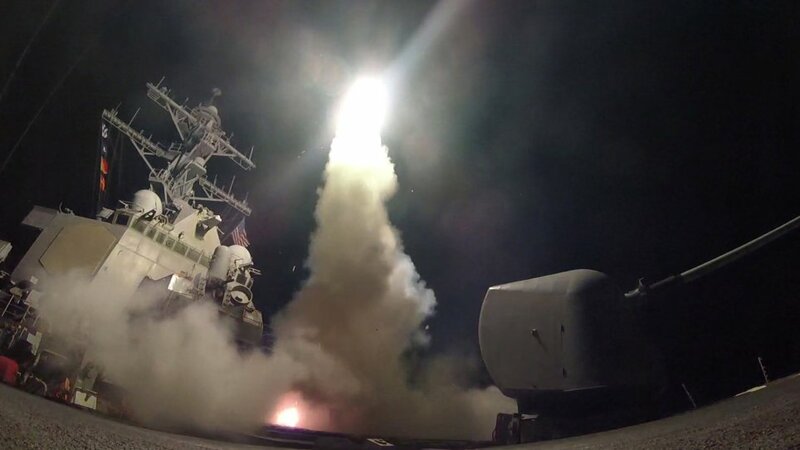 Last night the US launched a barrage of around 60 Tomahawk cruise missiles towards Shayrat air force base in Syria, in response to the horrific chemical attack on citizens in Khan Shaykun last Tuesday that killed over 70 people. This marked the US’ first intervention against the Syrian Government in the six-year-long civil war, and perhaps a u-turn in policy from President Trump towards favouring regime change in the country. Last week’s chemical attack was a wake-up call to nations around the world that Al-Assad’s Syrian Government, propped up by Russia, is still capable of the most serious of war crimes – despite the UN treaty drawn up four years ago in the wake of a similar attack in Ghouta. President Trump has previously proclaimed on separate occasions that almost all of the things his military did last night were not acceptable to him, but the pressures of the office may have finally forced his hand into enforcing international law in the way his predecessors have for generations. The targeted attack of a Syrian military base believed to have been the source for the weapons used in Tuesday’s chemical attack demonstrated a clear and appropriate demonstration of the US and international communities disgust at what’s happened in the country. No civilians have been injured, and for now, Trump is acting in what is a completely uncharacteristically measured way. The hands-off approach with Syria has not worked, and moving forward, I think it’s clear that some level of international involvement is needed to stop Bashar Al-Assad’s regime from inflicting further atrocities on his own people. This is understood by both the public and many Western governments. The spectre of Russia being involved on their side makes this one of the most precarious pieces of diplomacy and military strategy required since the Cold War. Couple this with the failures of similar reconstruction efforts in Afghanistan and Iraq, and there has been little political capital for the action needed to take place. All the while thousands upon thousands of Syrians have been slaughtered, living in a bombed out hellscape for years with little support from the supposed international community. And the man we have to presumably lead this effort is one of the most erratic, childish and incompetent politicians we could imagine. While Trump’s Presidency so far has been shambolic at best, last night’s intervention showed, as CNN’s Fareed Zakaria said, that Trump is now confident in his abilities as President. It was the right thing to do in crippling a part of the Syrian Government’s infrastructure so that they cannot launch a similar devastating attack on their rivals quite so easily. This is an act of international policing that many do not want to see America undertake quite so readily, but in the face of chemical weapons attacks that violate the Geneva Convention and basic human decency, then destroying an airbase is a mild retaliation. To consider Trump’s Presidency holistically is incredible important, and something that will get overshadowed in the next phases of the news cycle. There does seem to be a broad coalition of support for Trump’s actions both domestically and internationally, for perhaps the first time, and this will inevitably see his plummeting approval ratings rise. Whether Trump’s u-turn on the Syria question is driven by vanity and self-interest or a genuine concern for humanity is a genuine question, and one that is frankly depressing, so although he appears to be doing the right thing in this instance – we need to make sure that it continues and that it’s done for the right reasons. To that end, it’s crucial that the news media and the public in general keep this train of thought, that Trump is using Syria to aid the horrendous situation his presidency is in because of serious policy bunglings over his Muslim ban and over the failed reformation of Obamacare. Indeed, his Muslim ban explicitly banned refugees from Syria – the country that Trump now feels is in such a state that military action from his Government is necessary. In closing, though, rather than make recent events in Syria about Trump, let’s make sure that we remain our critical and compassionate focus on the effects the civil war has had on the people of Syria. Turning a blind eye to what has been a decimation of a country and a people has not worked, and it’s only with proper action that we can hope to see a semblance of peace return there. The international community has utterly failed when it’s come to Syria, and while there’ll never be a time to go back and fix the issue, it’s time to start serious and sustained efforts at finding a solution to end the conflict once and for all. To save the people of Syria, something needs to be done by a coalition of Governments from both Western countries and the Arab world. Russia needs to be placated so that they can save face and that they are not provoked. It needs to be a truly international effort that gives a sense of respect to all sides in the conflict so that they have incentive to stand down and promote peace. We’ve been here before with Syria, on several occasions – so let’s make this the time that the world finally stands up for Syria.